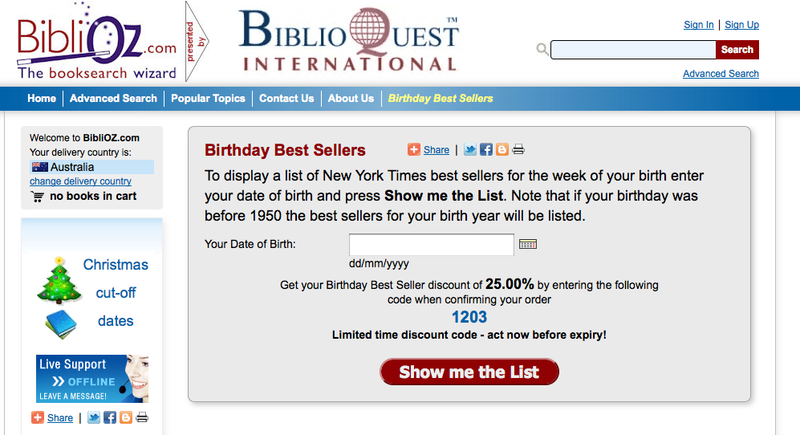 What were the ten 10 NYT bestsellers the day you were born? Next post: I’m older than most of the buildings in Anchorage. I’ll take a look, Jacqueline, and thanks for the invitation. The Agony and the Ecstasy, Irving Stone was number 1. Good book which, amazingly, I have actually read. But most exciting is To Kill a Mockingbird was number 3, my favorite book of all time! Gosh. An actual du Maurier! This is a cool toy! Cool! A favorite author was #1, Herman Wouk with ‘The Winds of War’ & #2 was a book I’ve always despised (freshman English, ugh) ‘Jonathon Livingston Seagull. Neat tool! My birth year is 1942. The list was by the whole year. I recognized 3 of the authors on the fiction list and know I read at least one of their books over time. Douglas, Steinbeck and Buck. The title I know I read for sure is THE ROBE. Did you know they published by carving the books by chisel in stone in 1942? e-books were not even anyone’s dream. I only ever read one, count ’em, one on my list.